Click the Notes tab in the Contact Editor. 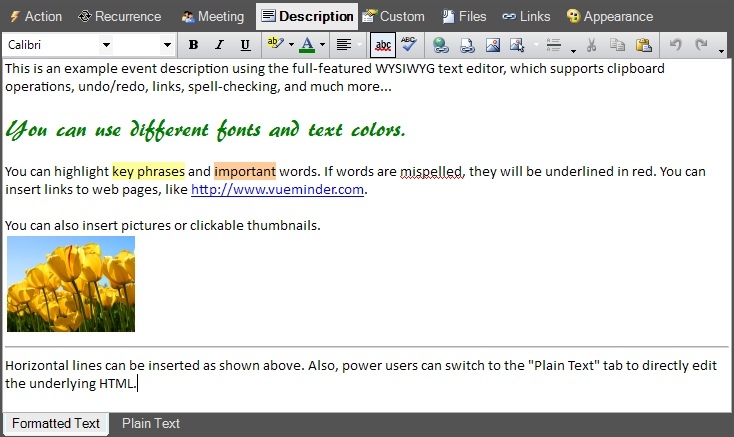 VueMinder provides a WYSIWYG (what you see is what you get) text editor for entering additional information about an event, task, note, or contact. This editor is accessed via the Description tab in the Event Editor, Details tab in the Task Editor, Note tab in the Note Editor, or Notes tab in the Contact Editor. If the text contains links to web pages or files, those links will be clickable in the Details Pane. You can hold the Ctrl key while clicking a link in the text editor to open the link. The text editor also supports drag-and-drop, so you can drag files or pictures from Windows Explorer into the editor. If you prefer plain text, or if you're an advanced user and would like to edit using HTML, you can click the "Plain Text" tab at the bottom of the editor. Any changes made on this tab will be reflected on the Formatted Text tab, and vice versa. A toolbar is provided at the top of the editor. This toolbar provides commands for changing the font name, size, style, and color. It also provides commands for adjusting the text alignment, inserting pictures and links, accessing the Windows clipboard, and undoing or redoing changes. Many of these commands also have keyboard shortcuts. For more information about a toolbar command, or to see its keyboard shortcut, hover the mouse cursor over the toolbar button. To select a different font for new text written after the current text caret location, or for text that has been selected, type in the desired font name or click the drop-down list to see all the available fonts installed on your computer. This is the size of the text, in points. A size can be typed in or selected from the drop-down list. The selected font size will be applied to any selected text, or any new next written after the current text caret location. This button toggles whether selected or newly typed text is bold. The keyboard shortcut is Ctrl+B. This button toggles whether selected or newly typed text is italicized. The keyboard shortcut is Ctrl+I. This button toggles whether selected or newly typed text is underlined. The keyboard shortcut is Ctrl+U. Use this command to highlight selected or newly typed text. A number of highlight colors can be picked by clicking the drop-down arrow. Note, if setting the highlight color, you should also specifically set the font color (don't assume black). Otherwise, the highlighted text may not appear correctly in the tooltips of the Calendar View. Use this command to change the text color of selected or newly types text. A number of text colors can be picked by clicking the drop-down arrow. This button shows a drop-down menu enabling the text alignment to be changed. This affects all text, not just the selected text. The text can be left, center, right, or evenly justified. This button toggles whether misspelled words are to be underlined in red. 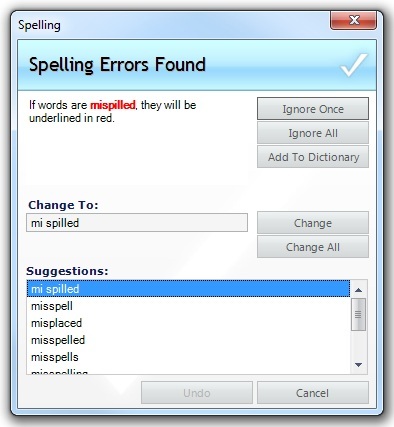 Note, spell-checking is only available when Windows is configured to use English. This button won't be visible if you're using a different language. This command will run a spell check of the current text. A window will appear enabling correction of misspelled words, or the addition of those words to a user-defined dictionary. Use this command to insert a hyperlink, such as the URL of a web page. The link must begin with http://, https://, or whatever the URL is prefixed with when viewed in your web browser. The link's actual display text will default to matching its URL, but you can change this by typing in whatever text you'd like to appear, as shown in the example below. To open a link from the editor, hold the Ctrl button and then click the link. When viewed in the Details pane, the link can just be clicked without holding the Ctrl button. The link will open in your default web browser. Use this command to insert a link to a file located on your computer or local network. A file browser will be displayed where you can select the file to be linked. As with web links, the link can be opened from the editor by holding the Ctrl button while clicking the link, or opened from the Details pane by just clicking the link. You can also drag-and-drop files into the Description tab as an alternative to using this button. Note, when sharing calendars over a local network, if you want the linked file to be available to all computers, make sure the file exists in a common shared folder or network drive, and is referenced using UNC notation, not the local drive letter. Use this command to insert a picture at the current text caret location. The location of the picture can be on your computer, local network, or a URL to a picture on the internet. If the calendar is shared and you want the picture to be viewable on other computers, make sure to enter a image source that is located online or accessible to other computers. 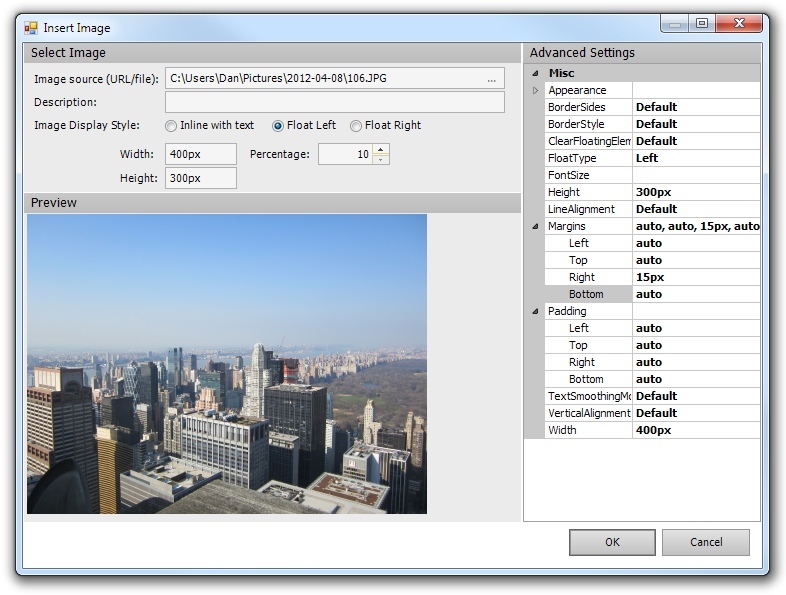 The Insert Image window provides a number of additional fields for controlling how the picture is formatter. You can position the picture inline with text or have text wrap around the picture when it is floated to the left or right. You can also adjust the picture width and height, in either pixels or a percentage of the original size. Additional parameters, such as border style and color, can be specified in the Advanced Settings section along the right side of the window. When finished, click the OK button to complete inserting the image into the editor. This button expands into a menu enabling the insertion of a clickable picture thumbnail of various sizes, from tiny to large. The picture thumbnail will be scaled to match the selected size, preserving the aspect ratio to prevent distortion of the image. Clicking the thumbnail will open the full-size picture in your default image editor or viewer. Note, to open the picture from the editor, hold the Ctrl key while clicking. This command will insert a horizontal line after the current text caret location. This line can be used as a visual separator. This command will cut the selected text and place it in the Windows clipboard. If no text is selected, this command will be disabled. The keyboard shortcut is Ctrl+X. This command will copy the selected text and place it in the Windows clipboard. If no text is selected, this command will be disabled. The keyboard shortcut is Ctrl+C. This command will paste any previously copied text or image. If no text or image exists on the Windows clipboard, this command will be disabled. The keyboard shortcut is Ctrl+V. This command will undo the most recent change. The undone change can be redone using the Redo button. The next most recent change will then be associated with the Undo command. This command does the opposite of Undo. It redoes previously undone changes.